Curriculum mapping is helping departments across UBC identify gaps or redundancies in their degree programs, and spot missed opportunities. Are you thinking of blending your course? Join us in Teaching in a Blended Learning Environment (T-BLE). Interested in Teaching in a Flexible and Blended Environment? Learn more about Teaching in a Blended Learning Environment (T-BLE), and hear what faculty members have to say about their experience with T-BLE. Are you thinking of blending your course? Register by September 23 for Teaching in a Blended Learning Environment (T-BLE). As part of the Flexible Learning Initiative, the provost has announced a call for proposals to develop a limited number of MOOCs. 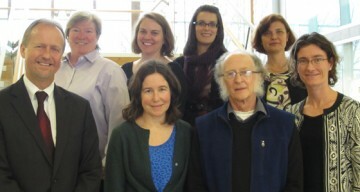 The UBC team of instructors and science educators that developed SCIE 113 has received this year’s Alan Blizzard Award.